The 104th Grey Cup presented by Shaw is coming to Toronto and will be played on Sunday November 27, 2016, the Canadian Football League (CFL) announced today. "This is a tremendous opportunity and an exciting new start for the Toronto Argonauts in 2016, to showcase what today's CFL is made of, and to celebrate the energy and diversity of Toronto's football community," said Jeffrey L. Orridge, Commissioner of the CFL. The championship game of the CFL, the Grey Cup, is Canada's largest single day sporting event. And the multi-day festival that precedes it is the country's best known celebration. In awarding the 104th Grey Cup presented by Shaw to the city of Toronto and the Toronto Argonauts on behalf of the CFL's Board of Governors, Orridge said fans can expect a different experience from the 100th Grey Cup held in Toronto back in 2012. "As great as that event truly was, it was a celebration of our history," Orridge said. "The 2016 Grey Cup will be all about the future. The future of our game, the future of the CFL, and the bright future of the Toronto Argonauts here in Canada's biggest city." The Argos move to BMO Field next year as they operate for the first time under the ownership of Larry Tanenbaum's Kilmer Group and Bell. "Today is an exciting day for football in Toronto, for the Argonauts, and most importantly for CFL fans in this city," said Tanenbaum. "We look forward to hosting a Grey Cup to remember next November, and the opportunity to showcase BMO Field as the new home to the Argos and the CFL in Toronto." "As we witnessed with the 100th Grey Cup in 2012, Toronto has always been a fantastic host city for one of Canada's most iconic sporting events and traditions. Hosting the Grey Cup next November will be a perfect culmination to the Argos' inaugural season at BMO Field." It was announced that fans that buy season's tickets to the Argos in 2016 will have exclusive front-of-the-line access to 104th Grey Cup tickets. 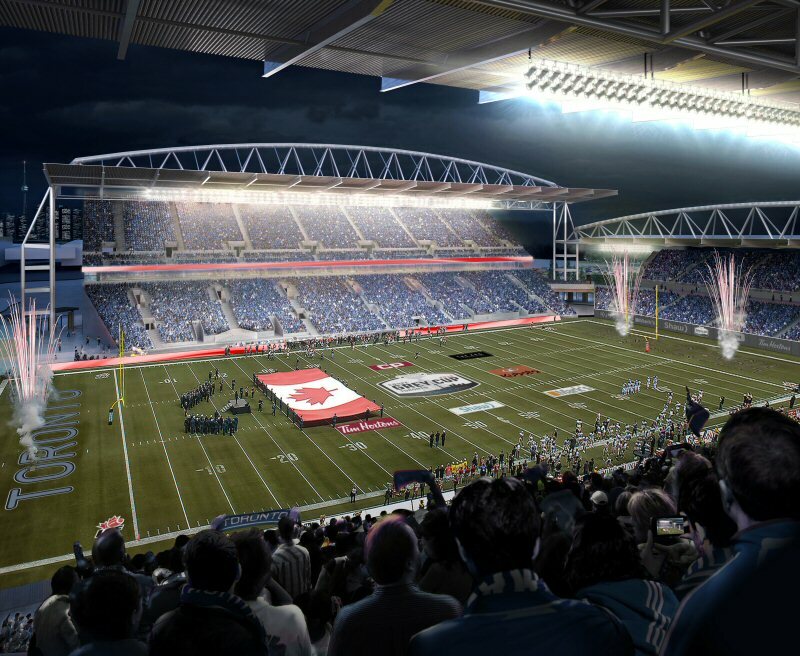 "The only way to guarantee you'll be there for Canada's ultimate football game is to join us all year long for what will be one of Toronto's great sports and entertainment experiences," added Tanenbaum. 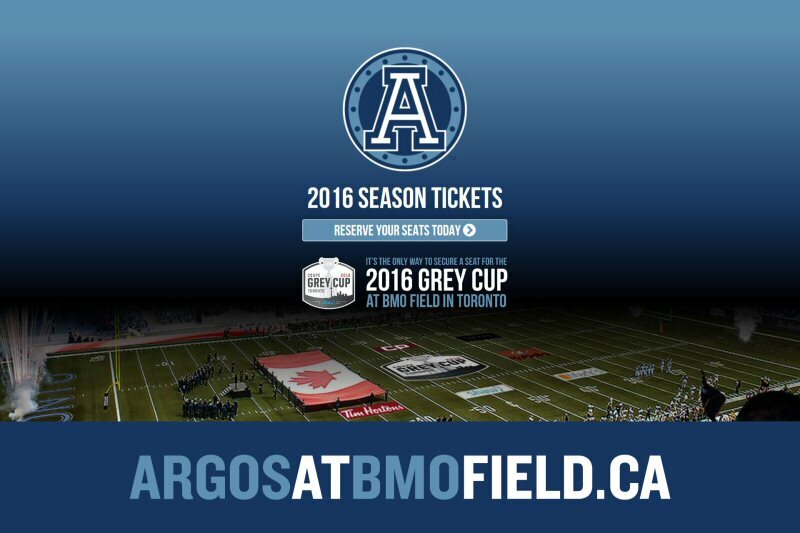 Fans who want more information on Argo season seats at BMO Field in 2016 can visit ArgosatBMOField.ca. Mayor John Tory, himself a former Chairman and Commissioner of the CFL, emphasized what a premium event like the 104th Grey Cup presented by Shaw will mean to the city's economy. 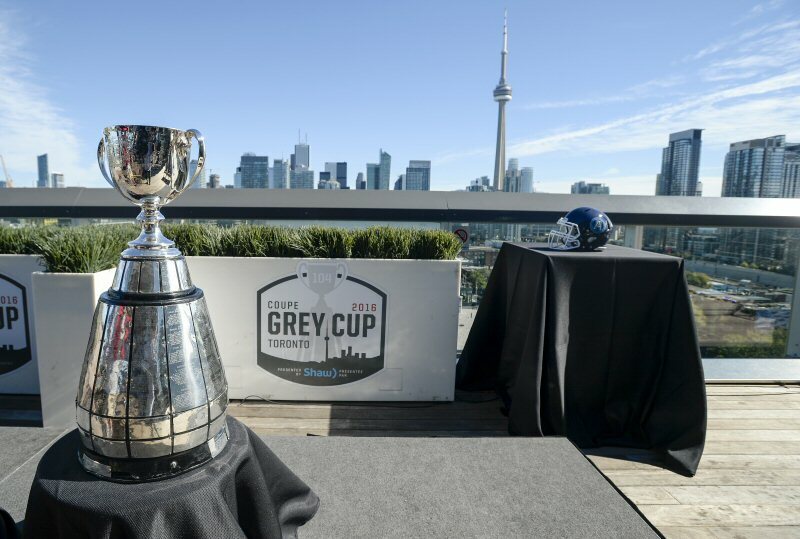 "The Grey Cup generates more than $100 million for host cities each year and we're thrilled that the game will be played in Toronto next November," Tory told reporters assembled on the rooftop of downtown Toronto's Thompson Hotel for the announcement. "Toronto sports fans are having a great year, and I look forward to attending this Canadian sports institution on our home turf." The Honourable Michael Coteau, Ontario's Minister of Tourism, Culture and Sport, said the Grey Cup festival is an opportunity to focus on the power of sport to encourage healthy active kids, cultural integrations and civic involvement. "This event will showcase the vibrancy of Toronto and our province, and our continued ability to host major and high profile sporting events," Coteau said. "It will bring thousands of fans from across the country to celebrate our national championship, and bring the associative economic benefits to this region." The total economic activity generated by the 100th Grey Cup in Toronto in 2012 was more than $133.1 million throughout the province, with $94.7 million occurring in Toronto. These expenditures supported $38.4 million in wages and salaries throughout the province, and supported 795 jobs, of which 596 - including $26.6 million in wages and salaries - occurred in Toronto. The net economic activity (GDP) generated by the event was $70.2 million in the Province of Ontario, of which $48.9 million occurred in Toronto. These findings came out of an assessment prepared by the Canadian Sport Tourism Alliance using the STEAM PRO economic impact assessment model, which is widely considered to be the gold standard for evaluating the economic impact of a particular event in a region or area. The 103rd Grey Cup presented by Shaw will be played Sunday, November 29, 2015 at Winnipeg's Investors Group Field. Artist rendering of what BMO Field will look like for the 104th Grey Cup presented by Shaw. 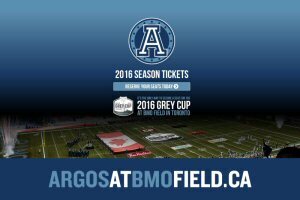 Reserve your tickets for the 104th Grey Cup presented by Shaw by purchasing 2016 Toronto Argonauts season tickets. The Grey Cup in front of the Toronto skyline. 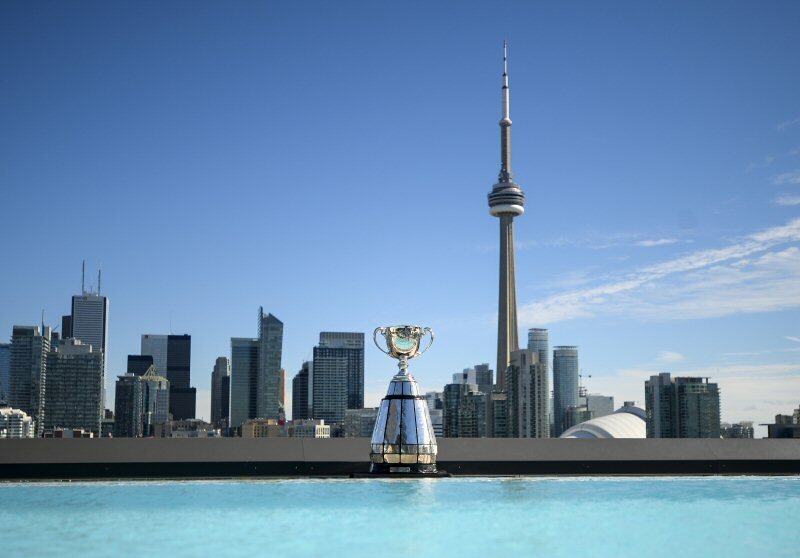 Grey Cup in front of the Toronto skyline with the 104th Grey Cup presented by Shaw logo.